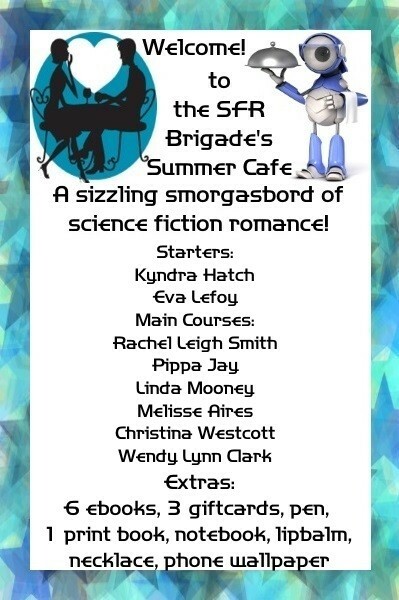 This post is part of the SFR Brigrade Summer Cafe Blog Hop. Check out the other blogs featuring short story appetizers, main dish novels, and sweet swag desserts all about Androids & Aliens this week. Scroll to the bottom of this post to enter to win! 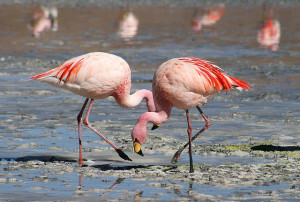 Question: What color are flamingos? “Flamingos Laguna Colorada” by [ Valdiney Pimenta] – Own work by uploader. Licensed under CC BY 2.0 via Wikimedia Commons. Perhaps you only know pink flamingos? Gray flamingos turn pink because they eat pink shrimp. (Mostly brine shrimp, also known as sea monkeys.) And shrimp turn pink when cooked because they eat caroteniod-producing planktonic algae. You see the food chain in action every time you look at a pink flamingo. Eating your way to a new color is nothing new to the animal kingdom. Cardinals are red because they eat tasty berries containing carotenoids, and finches metabolize these same carotenoids into yellow. If you keep them in captivity and feed them a diet without the tasty red berries, their colors will fade after a few molts, and you will no longer have vibrant birds. Similarly, zoo keepers and salmon farmers have to supplement diets or else their pink flamingos and salmon will revert to dull gray. Melanin pigments our human eyes, hair, and skin, and the amounts and ratios of the different types of melanin determine whether we are blue-eyed blondes, mysterious brunettes, or ravishing redheads. This is generally controlled by genetics or Lady Clairol. But Lady Clairol has a ways to go to catch up to nature! Box colors and spray tans can take hours, color contacts rip or fall out, and as soon as you stop the applications, you too will revert back to your normal color. In the science fiction future, I think we will definitely control our colors with more fun and ease. Leloo in The Fifth Element discovered a makeup device that applied perfect color with one click, and the receptionist for Mr. Zorg spent hours instantly changing from one nail color to another. Even now, cosmetology and technology change all the time, whether it is the recent discover of shellac “Gelish” nails that harden under UV light and last for weeks, or the discovery of paint that will never fade. I like the idea of changing hair color by eating. (I like food!) On the run from pursuers, my characters in Liberation’s Kiss go under cover like flamingos and cardinals: by popping melanin pills. “Um, what are you doing in there?” she asked. Her voice sounded too loud for the small room. He shut off the water and returned with a brown bag. Putting away her leftovers into the delivery cart – keeping it fresh and warm for later – he drew out cosmetics for changing her appearance. She swallowed a slow-acting melanin pill and a second pill that directed some of it to the stroma of her irises, to increase the Rayleigh scattering shifting her eyes from blue to green. She rotated her feet to the ground and then eased out, putting slow pressure on her heels. Pain shrieked up her legs. She sucked in a breath through her teeth. He eased an arm around her bare shoulder blades and helped her to stand, supporting her into the tiny room. She shivered on the cool tile. He adjusted to a comforting temperature and detached the nozzle from the wall. The stream eased down her sore back like a warm caress. She rested her hands on the tile while he rinsed her body, then had her lean forward, hands against the wall, and scrubbed the depiliatory cream into her scalp. Her hair dissolved like a color; she watched it disappear down the drain, careful not to get any splashes on her brows or lashes. Gentle hands stroked her head, tracing the soft lines of her bare skull, sensual. Under his relaxing ministrations, hair regrowth formula adhered to her scalp, and he rinsed the layers away, revealing the first bit of fuzz. She touched it tentatively. Red. In a few hours, it would grow as long as her finger tips, and in a day, it would reach her shoulders. She swallowed a calcium tablet and an E supplement, trusting him as he remade her into a new person. Without those minerals, her new hair would turn brittle and break away, fragile as strands of spun glass. His eyes traced the fuzz as his hands did, an odd expression on his face. If you could change something about yourself with one easy pill, what would you change? Thanks for stopping by! Check out the other blogs and enter the Rafflecopter below to win free ebooks, gift cards, phone wallpaper, pens, and notebooks! I read an article about them testing tablet on mice that changed pale mice to black mice. They’re working on it not just for cosmetic applications, but also as an alternative to suncream. Imagine being able to pop a pill for an instant golden tan? Being a redhead the idea of taking something that will turn my white skin a nice shade of brown rather than just burning has more appeal than avoiding hair dye, but I’d take both! That sounds so awesome! I often feel that we are living in the science fiction future – or that we’re almost there. Things like this only reinforce my feelings. Thanks for organizing this hop and stopping by to comment! What would I change? I’m looking forward to the make-you-younger pill, that one that puts a spring back in your step, makes bending over easy, allows you to throw away your glasses… Maybe not in my lifetime 🙂 Loved your excerpt – some great ideas there. I would love that too! I’m not a good candidate for Lasik and I would love something, anything that let me get rid of my glasses. Thanks so much for visiting!